PCS CDMA 3.5V/29dBm Linear Power Amplifier Module The AWT6131 provides the additional output power margin RF designers need to overcome additional post-PA insertion loss in tri-mode handset designs supporting E911 (GPS enabled). 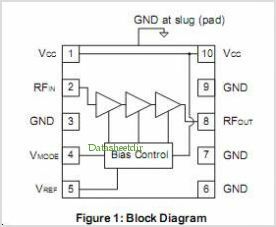 The device is manufactured on an advanced InGaP HBT MMIC technology offering state-of-the-art reliability, By Anadigics, Inc. This is one package pinout of AWT6131,If you need more pinouts please download AWT6131's pdf datasheet. AWT6131 circuits will be updated soon..., now you can download the pdf datasheet to check the circuits!